On 19 March, the ceremony of inauguration of Professor Gérard Albert Mourou, a foreign member of the Lithuanian Academy of Sciences, took place at the Academy. In 1985, working at Rochester University with the doctoral student Donna Theo Strickland, Professor Mourou applied the technology of chirped impulses for the amplification of the power of laser impulses. This achievement brought him the Nobel Prize in 2018. Professor Gérard Mourou, who founded a centre of ultrafast optics at Michigan University, has been collaborating with Prof. Algis Petras Piskarskas’s laboratory of the Vilnius University Laser Research Centre since 1992. In the same year, the scientists in Vilnius invented optical parametric chirped-pulse amplification (OPCPA) technology. On Prof. Mourou initiative, Lithuania was invited to participate in the preparatory phase of the international Extreme Light Infrastructure (ELI) and a preparatory project for Lithuania’s full membership in the ELI is currently underway. Multi-terawatt laser complexes are manufactured in Lithuania. Gérard Mourou was elected a foreign member of the Lithuanian Academy of Sciences on 12 February 2019, at a general assembly of the members of the Lithuanian Academy of Sciences. In his opening address, Prof. Jūras Banys, President of the Lithuanian Academy of Sciences, expressed his satisfaction at the fact that Gérard Mourou had been nominated to a foreign member of the Academy before he received the Nobel Prize and that the contribution of Lithuanian physicists to laser design also includes their research into nonlinear crystals. He then gave the floor to Gerard Mourou’s colleague Prof. Algis Petras Piskarskas. In his speech, Prof. Piskarskas noted that he had been working with the new foreign member for a long time, attempting to increase the intensity of the laser beam. It was Prof. Mourou who discovered a method based on the stretching and amplification of the laser impulse, at the same time avoiding damage to the laser material. It sparked a revolution in physics. Such powerful laser impulses enable research into nonlinear phenomena of quantum electrodynamics, to the extent of transforming light into particles. 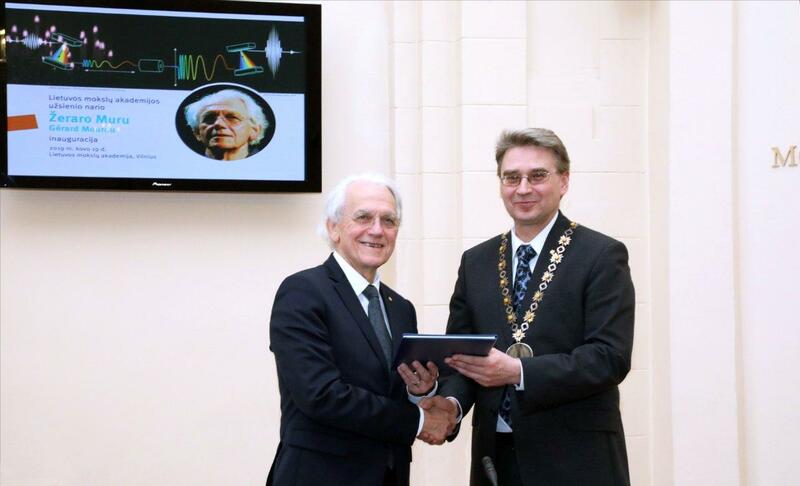 The discovery of Prof. Gérard Mourou has essentially changed the face of both Lithuanian physics and the laser industry. 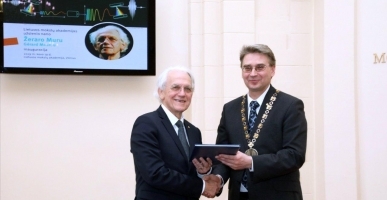 Gerard Mourou thanked the members of the Academy for the privilege and recalled that when at a scientific conference in Bayreuth, the native town of Richard Wagner, Prof. Piskarskas enquired about a possibility of optical parametric amplification of chirped impulses, he said the idea was crazy, but later it turned out it was excellent. Prof. Mourou assured the audience that his collaboration with Lithuanian laser experts would continue. Prof. Zenonas Dabkevičius, Vice-President of the Lithuanian Academy of Sciences, read aloud the diploma of a foreign member of the Academy written in Latin, and President of the Lithuanian Academy of Sciences pinned the badge of the member of the Lithuanian Academy of Sciences. Prof. Gérard Mourou invited the audience and those interested in laser transmutation of elements and other relevant applications to his evening lecture at Vilnius University Life Sciences Centre.